After a triumphant return, the MadDog has gone from strength to strength. Having surrounded himself with musicians considered to be among the best in the scene, and the release of the most anticipated album in decades, Ultra Violence, he has caused many a conversation in all the forums and newsgroups, as he headlined all the major festivals throughout Europe. His stage presence is more mental than back in the mid 80s’, and hearing him sing the much requested classics from the era that started it all, you can’t help but want to be a part of the wreckin! He STILL replies personally to all messages and comments on Myspace, and it begs the question “Where does all the time come from?”. 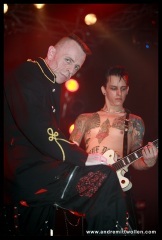 He still rarely comments on all the negative publicity surrounding his leaving the original band that made him the most famous Psychobilly frontman ever, and this has stood him in good stead with his many followers. He is set to be a major visitor to the European scene throughout 2009, so if you EVER get the chance to catch a show, DON’T MISS IT! 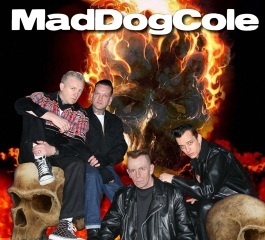 You can join his forum at www.maddogcole.com, and his Myspace pages at http://www.myspace.com/maddogcole06 & www.myspace.com/maddogcole07.